Hamilton’s Tavern (or “Hammy’s” as the locals call it) is located in the South Park neighborhood of San Diego right next to South Park Brewing Company. 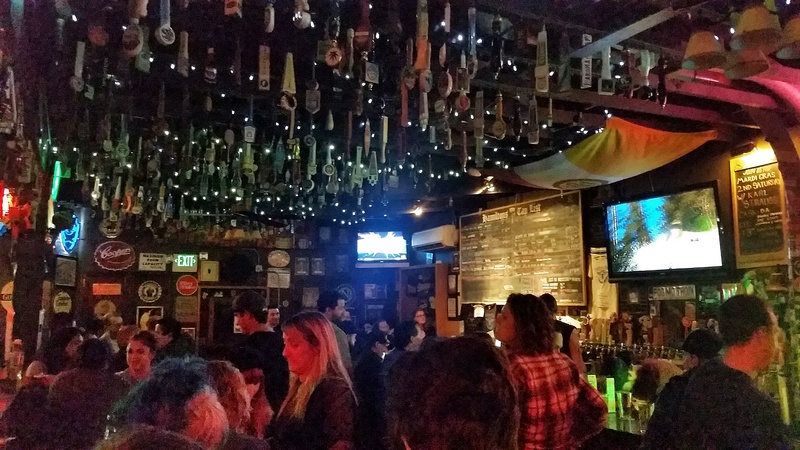 It’s in a great neighborhood if you’re trying to escape the crowds of Gaslamp or North Park. Hamilton’s has a neighborhood bar feel and is decorated with tap handles hanging upside down from the ceiling and white Christmas lights. The 30-tap selection is written on a chalk board next to the bar. There are a couple pool tables in an area separated from the bar which makes it a nice place to have a few beers and play a game of pool. They also serve food, but I didn’t get the chance to try it while I was there. Hamilton’s has a history as being one of the oldest bars licensed to serve been in San Diego so needless to say, they’re very well connected in San Diego beer. The taps are constantly rotating and it’s not uncommon to find some cellared kegs on tap. The selection seems to be California and West Coast centered, but I don’t really see that as a bad thing. While I was there I grabbed a pint of Pliny The Elder and one of Council’s Tart Saisons. Before I left the selection changed again to include Deschutes Abyss. I’d consider this one of San Diego’s must-visit places, but beware that you may be sucked in, lose track of time and not want to leave. I started this blog in 2011 to share my experiences traveling across the country visiting different bars, breweries and other beer related places. Check out the blog if you would like to read about some awesome places visited and beers I've tried. This entry was posted in California, San Diego, Uncategorized and tagged Beer, Brewing, California, Craft Beer, Home Brewing, Hops, San Diego. Bookmark the permalink.